The spirit of discovery has made heroes of mountain climbers and deep sea divers. We rally around it with undaunted belief that one day aliens will be our best friends, if we can just push deep enough into space. Cloud Becomes Your Hand reminds us that this magic of new worlds isn’t just on the edges of civilization; it is all around us. Like a children’s show on PBS, depicting urban life with a frenetic jazz of togetherness and purpose, theirs is the sound of exploring your own city. It is the sound of meeting all the surprising people around you. Surrealism, Dada, psychedelia; these are just fancy words to describe the simple thing this group has done. They’ve collected a bunch of exciting sounds and tied them together with the exclamation, “We’re all here, living these wild lives with each other!” It is a sentiment explaining the joy and wonder in a child’s eyes. A sentiment Cloud Becomes Your Hand reminds us is for everyone, forever. Don’t miss this extended footwork set that aired on Streetbeat earlier in the week, featuring DJ Earl, DJ Phil and DJ Heavee D. Dummy called it “bananas,” which seems more or less appropriate. It’s rad stuff. Check out both parts below. 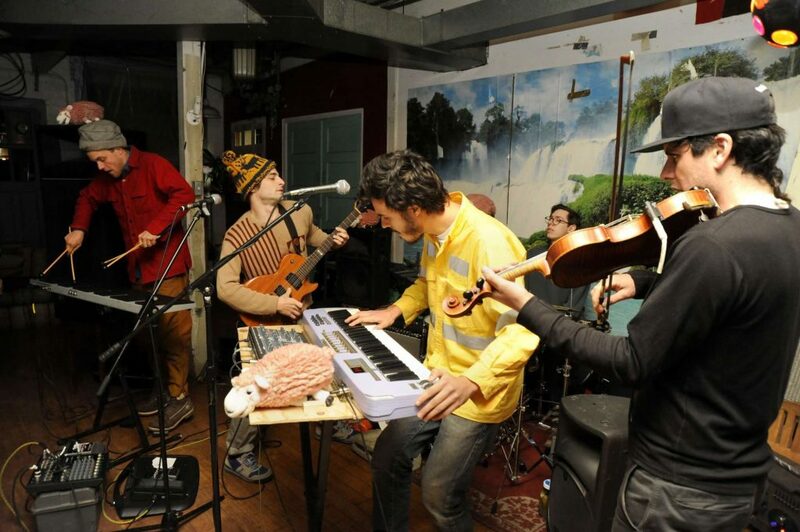 Los Perros Cubanos stopped by in February to play an Airplay set, and—though the set isn’t on the Airplay website at present—we still wanted to share the results. LPC will be playing at Zocalo tomorrow night at 8 PM, so check them out if you like what you hear. For more on Airplay, including archives and a list of upcoming acts, check out their newly resuscitated website. On Monday, we posted an interview and in-studio session with hammered dulcimer player and Evanston native Max ZT, also of the group House of Waters. Now, check out two exclusive videos from the set, recorded during the session last month. Our thanks to Drift producer Svyat, who helped out with filming. House of Waters; photo used by permission of band. 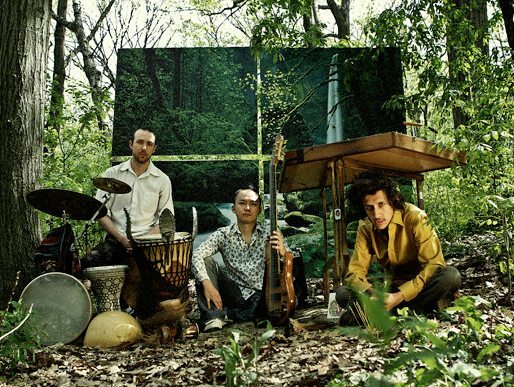 Comprising hammered dulcimer virtuoso (and Evanston native) Max ZT, 6-string electric bassist Moto Fukushima, and percussionist Luke Notary, House of Waters incorporates sounds as wide-ranging as Senegalese sabar music, formal structures of Indian santoor music, free jazz, and more. The day before the official release of their 3rd and latest album, Revolution, House of Waters’ Max ZT joined Continental Drift for a full 2-hour live in-studio performance, interview, and co-DJ session. After the jump, check out the full set on Mixcloud. What happens when you put four guys from the Chicago art-rock scene into a band together? Chandeliers. What do they sound like? Well, using sound machines and synthesizers, Chandeliers describe their sound as “shimmering, beach-ready electronic jams” and listening to their tracks one can’t argue with that. Attempting to identify the origin of their sound one is forced to think of Krautrockers, post-disco dream teams, and funk kings, but one thing is certain, this Chicago quartet has a sound all unto their own. Garnering positive reviews for their past three albums from the likes of XLR8R, 20 Jazz Funk Greats, and The Wire, Chandeliers is a group to keep your eyes and ears on. Check the video and see for yourself. Our thanks to Matt Ludwig, who shot and edited the video; and to Ethan Simonoff, who recorded the audio. In case you didn’t notice, Sonic Celluloid is coming really, really soon (May 18! This Friday!). We’ve got a great line-up of local artists coming to play, including headliner Cleared and openers Wume and Good Willsmith. It’s happening at the Block Cinema, and you can find all the details at the Facebook event page. We think it’ll be a real eye-opening experience. So with that in mind, we thought we’d share a video we put together when Wume came to the studio a few weeks back for an Airplay set. You can check out the whole set on Airplay’s website here. We’ve got some more video coming from Airplay and the rest of station in the near future, so stay tuned! Exclusive Maps & Atlases Acoustic Track! Maps & Atlases stopped by the WNUR studios this past Tuesday, performing a stripped-down acoustic set in anticipation of their upcoming show. They’ll be headlining at Metro this Friday to kick off their US tour. Tickets are $16 and doors open at 8PM. Be sure to download the exclusive mp3 from part of their performance below. 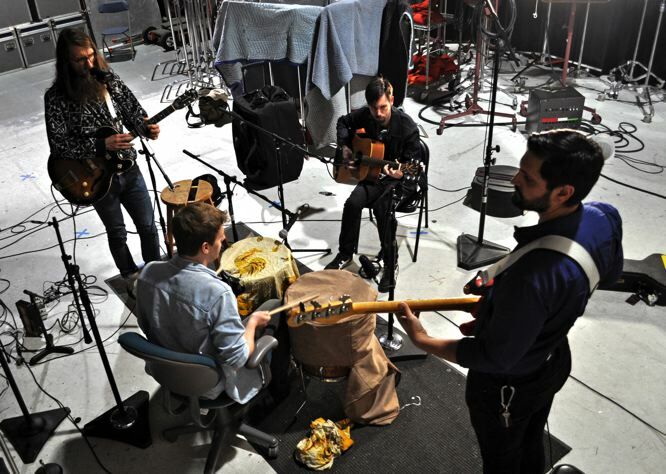 As always, you can stream all of WNUR’s in-studio performances (including this one!) on the Airplay archive page here. Stay tuned for more exclusive in-studio mp3 releases in the future! 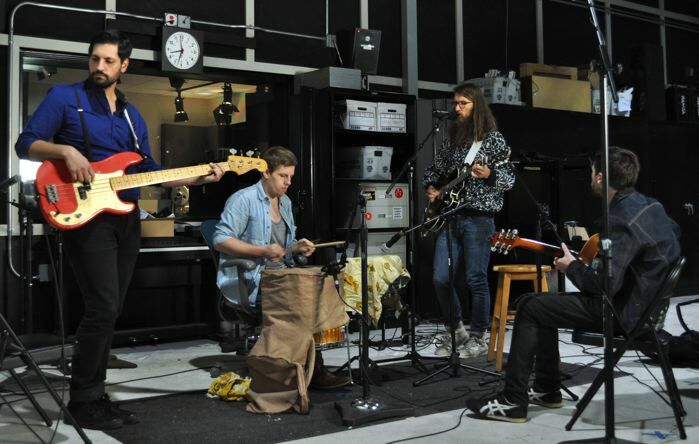 Fever (WNUR Live In-Studio) by Maps & Atlases — Right click to ‘save as…’ to download.